It’s time to publish the statistics derived from the cyber attacks timelines of May (Part I and Part II). As usual, the first chart is the Daily Trend of Attacks: after an initial peak the trend seems quite stable with two spikes in the last two weeks. 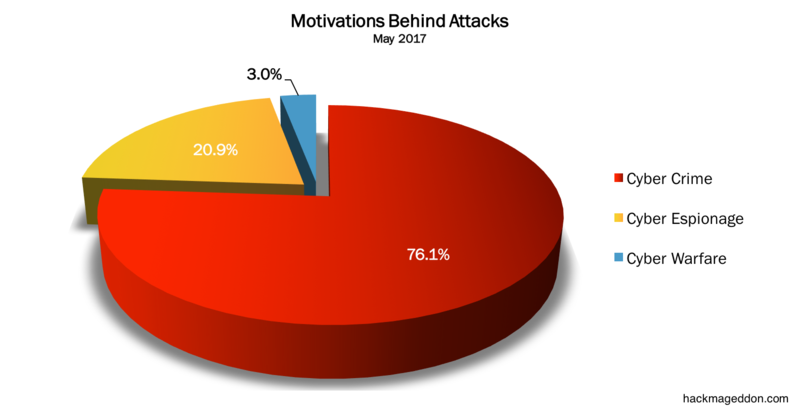 Cyber Crime leads the Motivations chart, with 76.1% essentially stable (was 74.1% in April). Cyber Espionage is equally stable to 20.9% (was 21.2% in April). Cyberwarfare grows from 1.2% to 3%, whereas in May I haven’t recorded any Hacktivism event. And guess what? Account Hijackings and Malware events rank on top of the Attack Vectors with 19.4% (were respectively 21.2% and 24.7% in May). Targeted attacks drop to 14.9% from 23.5%. The Distribution of Targets Chart is led by Industries (26.9% vs 23.5%) ahead of Single Individuals, just line in April (16.4% vs 20%), Education (14.9% vs. 10.6%) and Governments (7.5% vs 10.6%). The Industry Drill Down Chart is led by Retail (16.7%). Dear Paolo, In your posts you mention references to the source data being provided at the end of your slides. I am wanting to understand, in this world of ‘false news’, whether your information is credible, or perhaps to understand how the data is aggregated to assess it’s credibility. Can you help me with this? Is there an outline of the process you use for data aggregation or data sourcing that would help understand the credibility of your posts? Thank you in advance. Look at the timelines and click on the link. There is the source.